Wet/dry shop vacuums are a must have item for your garage or work-space. Although they are usually called shop-vacs, that is not the correct terminology since Shop-Vac is an actual brand. They are especially useful for sucking up saw dust or liquids. There are also more advanced dust extractors which have attachments that work with power tools to capture the dust they create. Some of the features to look for, besides actual performance, is the tank size, filter, hose diameter and length. The filter can be really important because if you are working with fine sheet rock dust then a good HEPA filter is a must. For most household and garage units a 9-14 gallon tank is fine, but if you are cleaning up wood chips or sucking up lots of water you might want to consider a 15-20 gallon tank. 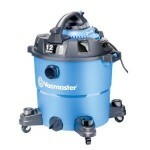 Below we review the top 10 best shop vacs. At the bottom of this article we also have a spec comparison chart. For more information check out our wet/dry shop vacuum buying guide. We selected the 8.4 gallon Fein 9-20-28 TURBO II as the best shop vacuum and best dust extractor due to its superior suction and dust collection. If you need an auto-start dust extractor to use with your power tools such as a router, sander, miter saw, or table saw then look no further. It features a long 13 foot hose with a 1.375″” diameter which will handle dust fine, but might struggle with larger wood debris. Perhaps the nicest attribute to the 9-20-28 is the noise. At just 66 decibels, it is significantly quieter than most models. Priced at $498 it is expensive and might be overkill if you don’t need to use your shop vacuum as a dust extractor with power tools. This version comes with a set of attachments included, although you can also get versions of the 9-20-28 without attachments or the HEPA filter for as much as $100 cheaper. At about $139 the Ridgid WD1851 is significantly less money than the Fein. This 16 gallon Ridgid model is great to use on jobsites and users on Home Depot have rated it at a 4.7 out 5. 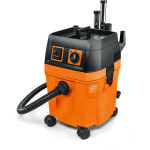 It can handle heavy-duty cleanups, but doesn’t offer the same kind of dust collection as the Fein. It comes with a top handle, cord wrap, and accessory storage bag which are features that all come in handy and that you often don’t find on lower price units. The top handle combined with larger rear wheels make it easier to get up and down stairs. The hose is 7 feet long and has a diameter of 2.5″. We recommend the Ridgid WD1851 primarily for use on job sites or users who will use it a lot. For more occasional users there are cheaper options available. The DeWalt DXV14P is the 14 gallon version of DeWalt’s new wet/dry vacuums. 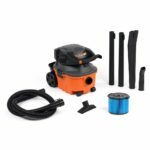 Selling for about $133 this model has super strong suction for debris or water, all while being quieter than most other shop vacuums in its class. The DXV14P has a large metal handle bar, large wheels, and rubber castors for easy maneuverability. Its 7 foot long, 2.5″ diameter hose is flexible plastic and won’t kink. Other features we like include a cord and hose wrap, water spout with hose adapter to drain fluid easily, built-in accessory storage bag, and a blower port. We recommend the 14 gallon DeWalt DXV14P primarily for professionals or semi-pros who will use it a lot. For the casual home owner you might want a smaller model. It is also available at HomeDepot.com. The Craftsman 12007 shop vacuum provides similar performance to the Ridged WD1851 although it does not have a top handle, but it does have even more suction. It comes with a large 16 gallon tank with an extra large liquid drain on the bottom of the tank which makes it quicker and easier to drain. The hose is 7 feet long with a 2.5″ diameter. It also has a detachable blower which might come in handy. 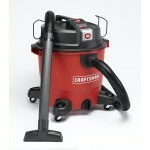 Priced at $110 the Craftsman 12007 provides excellent performance at a decent price. In fact you won’t find better suction at a lower price than this. The Fein 9-20-27 Turbo I is significantly cheaper than the Turbo II model at $299, but it also only has a capacity of 5.8 gallons. It still has powerful suction and is also super quiet at just 66 decibels. 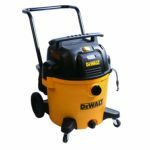 This version is a great auto-start dust extractor as long as your power tools are not generating too much dust since the tank will fill up faster. A major plus is that the 9-20-27 features the longest hose of any shop vacuum on our list at 16 feet with a 1.375″” diameter. If you need to collect small amounts of dust then the Fein 9-20-27 Turbo I is perfect. However, if you need to collect large amounts of wood debris or a large volume of liquid then this unit will not work well for you. The Ridgid WD1451 used to be our pick for the best shop vacuum under $100, but it now sells for $109. You still might be able to find in on sale for under $100 occasionally. At either price it is still a good value since it scores high marks in both its wet and dry suction. 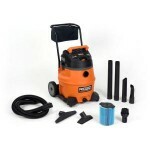 This 14 gallon model features a 7 foot hose with 2.5-inch diameter and comes with an auto detailing kit. The WD1450, which is this vacuum minus the auto detailing kit, was picked as a Best Buy by the leading consumer magazine. Overall we feel that the Ridgid WD1451 is a perfect choice for a normal user who does not need professional dust extraction. The DeWalt DXV10P really hits a nice sweetspot in terms of performance versus size, although it is bit more expensive than similar models with a price around $133. It provides enough suction to handle any job, while the 10 gallon size tank doesn’t take up as much room in your garage or shop as the larger models that have more suction. DeWalt also claims it is up to 40% quieter than other shop vacuums in its class. The DXV10P comes with a 7 foot long, 1.875″ diameter hose, tank drain, cord wrap, hose strap, built-in accessory storage bag, and a blower port. 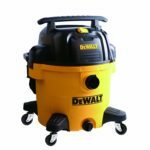 Overall we think the DeWalt DXV10P is good choice for any home user who wants a quieter wet/dry shop vacuum that does not need the extra large capacity. 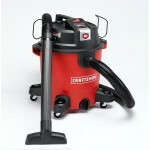 Our new selection for best shop vac under $100 is the Craftsman 12006 which sells for $90. The 12006 also ranks as the best 12 gallon shop vacuum. It features XSP suction, although the motor is a bit less powerful than the 12007 version. It has a 7 foot, 2.5 inch diameter hose and on-board hose, accessory, and power cord organizers to reduce overall storage space. We would recommend Craftsman XSP 12006 for any user who needs an affordable way to clean up jobs around the home, shop, or garage and does not need dust extraction. Many other publications and sites have rated the Vacmaster VBV1210 as one the best values. Priced from $83, users have rated it at 4.4 stars on Amazon. This 12 gallon model does not have quite as much suction power as the units we rate higher, but it still works great for cleaning up after basic jobs. One nice attribute of the VBV1210 is that it also features a detachable blower. It has a 2.5″ diameter, 7′ long hose. The Vacmaster VBV1210 will work fine for basic jobs for almost all homeowners, but it is not recommended for fine dust collection. 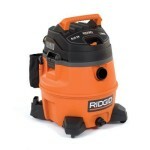 Our choice for the best small wet/dry shop vacuum and the cheapest shop vac on our list is the $79 Ridgid WD4080. With just a 4 gallon tank, it won’t hold a lot of material or water, but that also means it takes up significantly less space. While not quite the performer as some more expensive models, the WD4080 surprised us with the amount of suction it did have. The Ridgid WD4080 comes with a 1.875″” diameter, 7-foot long hose, large rear wheels and castors, and an accessory caddy. An added bonus is that the power head of the vac detaches and turns into a handheld blower that outperforms many leaf blowers. Overall the Ridgid WD4080 is for someone who needs a wet/dry vac to do occasional jobs like cleaning the car or cleaning up after a job, but does not want to spend a lot of money or have the unit take up a lot of space. Types of Jobs – Knowing which types of tasks you will be using your shop vacuum on will determine which style you should get. For general wood-shop clean up such as wood chips and shavings, experts recommend a 2.5″ diameter hose. Hoses smaller than this might clog, however if you will be using the hose as a collector on your power power tools, then a smaller and more flexible hose might be preferred. If collecting dust is your primary use then get a automatic tool-triggered vacuum for dust extracting. Capacity/Tank Size – Go with a bigger tank, 15-20 gallons, for sucking up wood chips or other big cleanups such as liquids. For basic garage use 9-14 gallons is a good size. Remember also how much space it will take in your shop. You can also get wall mounted units with long hoses if space is a problem for you. Filters / Bags – You will need to clean and eventually replace your filter, so know how much a replacement costs – this can vary greatly for different models. For some projects, like sheet rock, you might need a special filter like a HEPA filter for the fine dust. Some models use bags to collect dust and debris – you may want one built for fine dust, sometimes called sheetrock bags. Also most models require you to change filters for wet versus dry operation. Noise – Most units are very loud at around 80 decibels and up. The best wet/dry vacuums are around 65 decibels. Drain Valve – You will want this to drain any fluids otherwise you have to take the lid off and lift and tip the tank to empty it, which is not an easy task with 16 – 20 gallons of liquid. Maneuverability – A wide set of wheels and a low profile will help to prevent tip-overs. Also if you have to transport your vacuum up and down stairs then look for a model with large back wheels and a handle for easy use. Storage – Cord wraps and on-board storage for accessories keeps everything neat and tidy. Accessories/Attachments – Remember to check which attachments come with the unit you want to buy. Some brands come with only very basic accessories and you will need to purchase more to accomplish your tasks. i was hoping this article would have covered hoses. like how does the diameter and length affect the hp & suction of the unit. i’m looking to replace my short hose on an older 4.0 hp 20 gal. original SHOP VAC that i use all over for debris,auto & sawdust. i’m looking at a 1-1/4 dia x 20′ cen tec hose ( my unit has the 2-1/2 inlet which really measures 2-1/4, why is that also) because it is long for doing cars w/a kit. but i don’t want to lose suction as it’ll be the hose i’ll use for everything…suggestions/facts? You can improve the rating by adding flow rate for each. This will guide the selection process.